This book is classic Douglas Bond - a fast paced thriller with a Christian undertone. The characters are beautifully developed, so that their emotions can be shared with the reader. They feel the fear of battle, the painfulness of loss and the toughness of finding courage when there is none. The story centres around William Tidd, an orphan who cares for his sister, with the help of his friends Noclas and the Indian, Charlie Salitat. As war breaks out between white settlers and Indians, he joins the Washington Territorial Militia tasked with defending Washington Territory and finding the Indian chief Leschi. 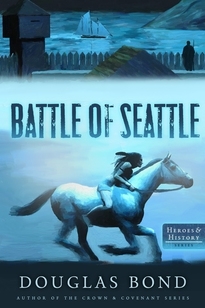 William Tidd becomes an express rider with his beloved horse, Prophet, and fights through skirmishes, raids and battles, culminating with the Battle of Seattle. This is a compelling novel and an amazing addition to the 'Heroes & History' series. I recommend the book highly, even if you do not have much prior knowledge about the Pacific Northwest, as none is needed. 'Battle of Seattle' by Douglas Bond is published by P & R Publishing in paperback, £8.99.